The Pure Tea tea plantation is situated in China at the Tian Hu Shan, an imposing mountain in the Tianshan mountains in the province of Ningde. The Tian Hu Shan is 1300 meters high and consists of several levels overgrown with cultivated woods. 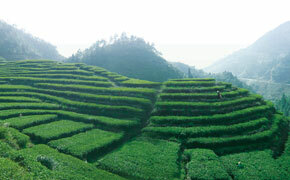 Ideal for tea cultivation, because each year there is a rainfall of 1900 mm pure water. The forest and the natural humidity give the mountain a nutritional ground, which makes a terrific soil for the plantation. of biological certificates: OTRDC, USDA and BCS.